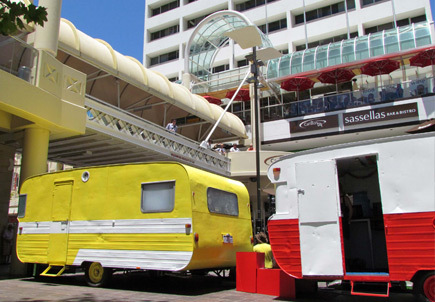 A FLEET OF RETRO caravans is drawing a lot of attention on the streets of central Perth. 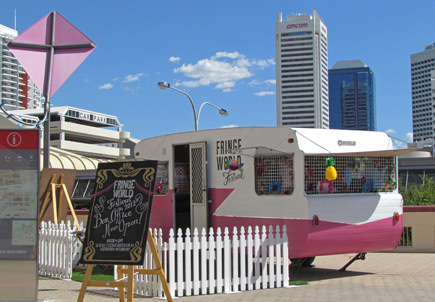 The vans have been transformed from wrecks into venues for use in the Fringe World Festival, which runs through to 19 February. The rigs have been prettied up and fitted out as mobile ticket box offices, performance stages, bars and back rooms for performers. 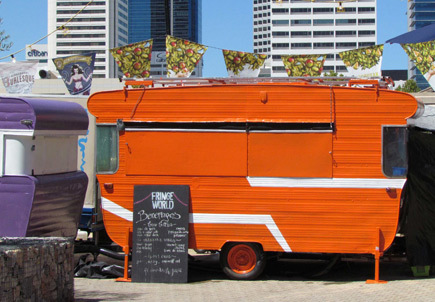 This unusual and innovative idea is the brainchild of Katie Dixon, from the arts organisation Artrage. She is associate producer and production manager of the Fringe Festival. She and her colleagues tracked down the wrecked vans, kitted them out for their new roles, and painted and decorated them. Then George Day Caravans of Maddington, WA gave the caravans a mechanical service, checked out the electric wiring, and had the vans registered so they would be street legal. The caravans are all aluminium vans from the 60s and early 70s. Apart from one Franklin, they were all manufactured in WA by the Modern and Baravan companies. Katie said: “Each caravan has its own quirks and personality, and we tried to take this into account during the restoration." 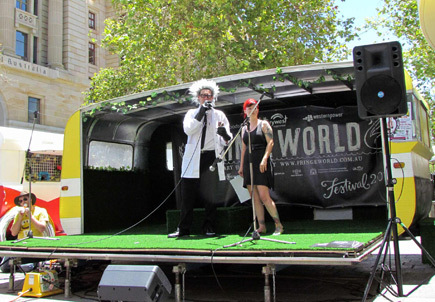 They are all very eye-catching and match the retro/alternative aspects of the Fringe Festival. And the festival staff who are working in the caravans love them. 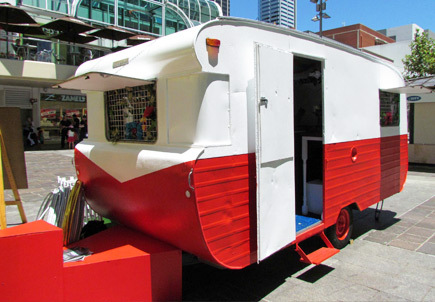 The young lady in the Franklin box office van told us: "It feels nice to work in an old caravan. It’s so different from an office."